A few weeks ago, I asked how do we stay in love with our lives? Step 0 may be to stop thinking our way out of pain. Maybe Step 1 is practicing how to see, hear, and engage with others. My ear ached all month. After ten days of rotating cold medicines and a doctor visit without comfort or new information, my head was in my husband’s lap in urgent care. We entered the exam room. The nurse helped me lay flat, lowered the lights, and leaned over with concern. And without conscious awareness or involvement, I began to cry. Silently, tears dripped down my face as I answered questions about medical history. Relief. She saw my pain, she heard me. I wasn’t alone. Have you had that experience? When you’re feeling alone and miserable and someone finally sees you, pays attention, gets it, and responds with care? To be seen and heard. IT FEELS SO GOOD. I love this. It’s such a concise way to describe the skills we use to show up for each other. To see what a person is sharing nonverbally or the emotions you can feel from them, to hear the words they’re saying, and for us to step toward them with engagement and interest. The way we communicate that we value the other person. “Five Dates” may be about romantic relationships, but decades of research from the Gottman Institute has shown that these same principles apply to friendships, parent-child relationships, and work relationships among peers and with leaders. The Gottmans also propose a useful frame for understanding the microbehaviors in a relationship that build up or break down connection over time. The Gottmans suggest that relationships are composed of bids, i.e. verbal and nonverbal behaviors that partners engage in, either building connection with successive back-and-forths or fizzling out by avoiding or reacting negatively. Or turn away from me (walk off the tennis court all together as the ball rolls into the bushes). A few years ago I was discussing my recent marriage anniversary with my best friend, retelling how my husband and I reflected on what we’d learned and loved over the years. My best friend said, “aww what did Tim say?” …I didn’t remember. I couldn’t remember a single thing he said and I could feel my insides curl with shame as she stuttered with surprise. I had set up a life in which my presence was only guaranteed for those paying me. And one of the most precious people in my life was getting leftover remains. Half present evenings and rote Q & As, my day was good, I feel fine, how are you, will you make dinner or should I? How? 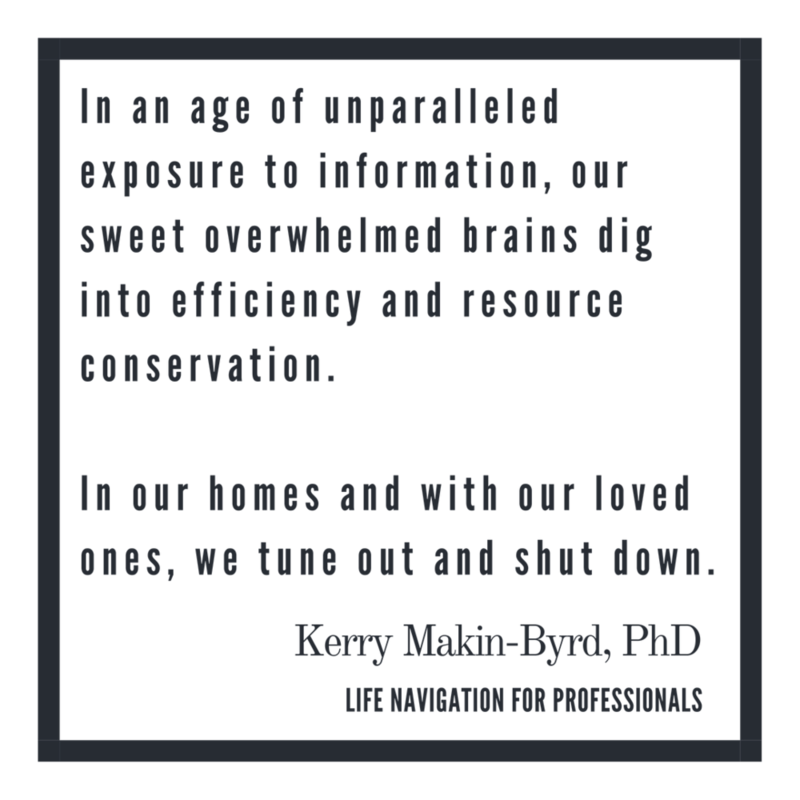 In an age of unparalleled exposure to information from around the world, our sweet overwhelmed brains dig into efficiency and resource conservation. In our homes and with our loved ones, we tune out and shut down. In the social realm, sometimes it feels like we take turns giving our updates instead of connecting, communing, and *inter* - acting with each other. I’m trying to be clear seeing, honest, and generous about what I need to live well at work and home (e.g. nine hours of sleep each night, total digital turn off time, and a 30 minute buffer zone to transition between work and home). We’re trying something different at our house, simple starts to step out of the structure of inertia. We’re trying to step out of the pattern of talking without saying anything, of not staying in love with our lives, ourselves, and each other. We started simple. My daughter brought “poopsicle, popsicle, dreamsicle” back from camp. Each day at dinner we review a highlight, a low light, and what each of us is looking forward to. Tara Brach, in a podcast episode that I can’t find, talks about the questions she and her husband ask each other each week related to times they felt connected, times they felt alone, and what they’d like to revisit together (all brilliance is Tara Brach’s and all mistakes are mine as I’m summarizing from memory). It might be enough to start with any question you haven’t asked before. As an aside, New York Times lists 36 questions that research suggests increase intimacy between people. More great suggestions for questions couples should ask each other from the aforementioned ‘Five Dates’ folks. I do this so much better with my daughter, asking her about the surprising, painful, or funny moments of her day. I guess she and I don’t have as many years of scripts. And her daily growth and change seems more apparent. Even though I know it can be true for all of us if we look closely enough. So I’m working on seeing with new eyes my friends and husband and self too. Asking what they’re learning, what they’re reading, what’s new and what feels scary. Really looking at them. What do their faces look like today? And how am I today? What is the state of my full heart and rambling mind, who so easily swings from full throttle love to overwhelming fear. How do you do this? There is so much wisdom among you all reading this - how do you show up for your loved ones? How do you stay present and engaged in a sea of distractions calling your name?